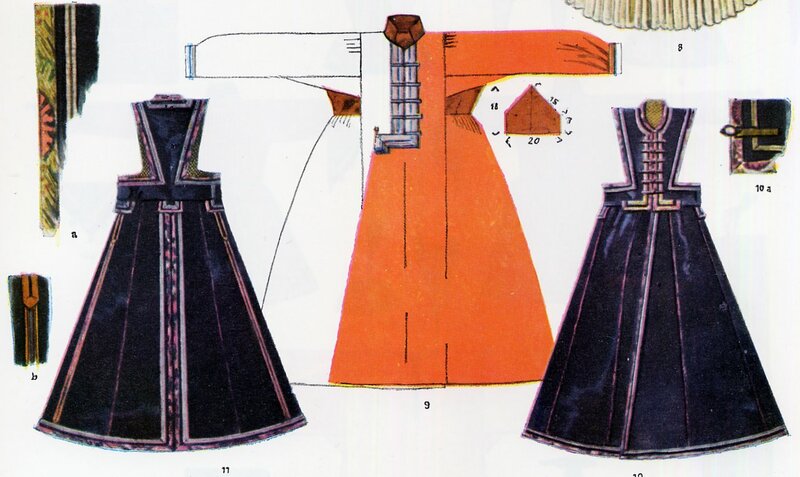 Today i will talk about the costume and embroidery of the Kalmyk people, also spelled Kalmuk. They live around the mouth of the Volga, where it empties into the Caspian Sea, and the surrounding steppe. Here is a map of Kalmykia, showing its relationship to other peoples in the region. Kalmykia is shown in a dark rust color. You can see that the Kalmyks are mostly surrounded by Russians, shown in pale green, but that they are not far from Kazakhstan on their east, shown in darker green, and also not far from the Caucuses, and in fact border on Dagestan, shown in bright green to their south. The capitol is Elista, and this is their flag. 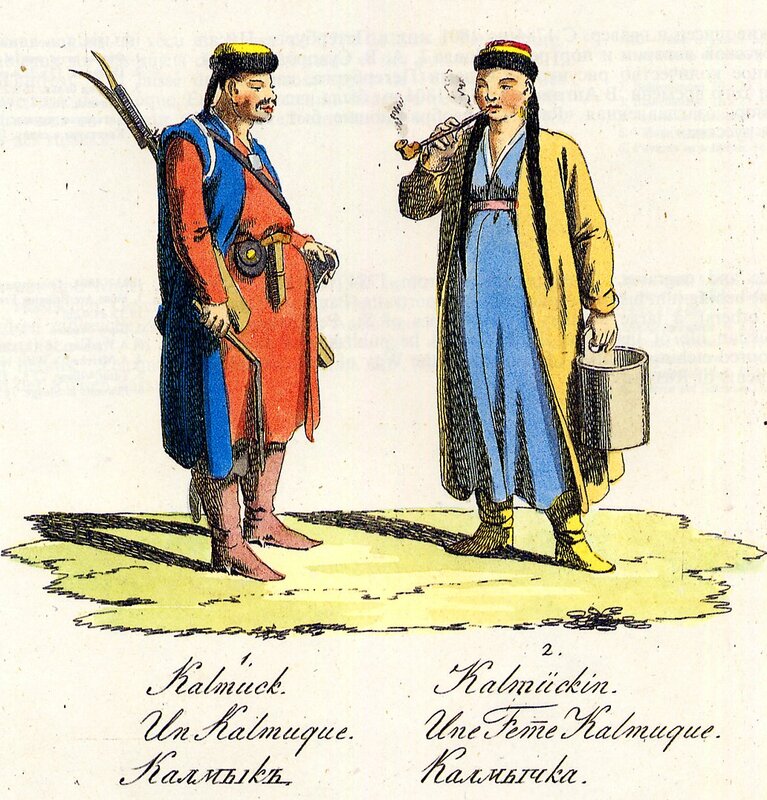 The Kalmyks are part of the Oirat people, who are originally from western Mongolia and neighboring regions. They left after a prolonged conflict with the Khalkha, the ruling people of Mongolia. The migration took place between 1618 and 1630, in which year they arrived in their present homeland. The word Kalmyk is from the turkic, meaning 'remnant'. It was at first applied as a derogative, but has been embraced by the Kalmyk people. Those who stayed behind still refer to themselves as Oirat. The area had been part of the Astrakhan Horde, but their power had long since dissipated. It was nominally under the control of the Russian Empire, but in fact, it was very thinly inhabited, mostly by nomadic Nogay. 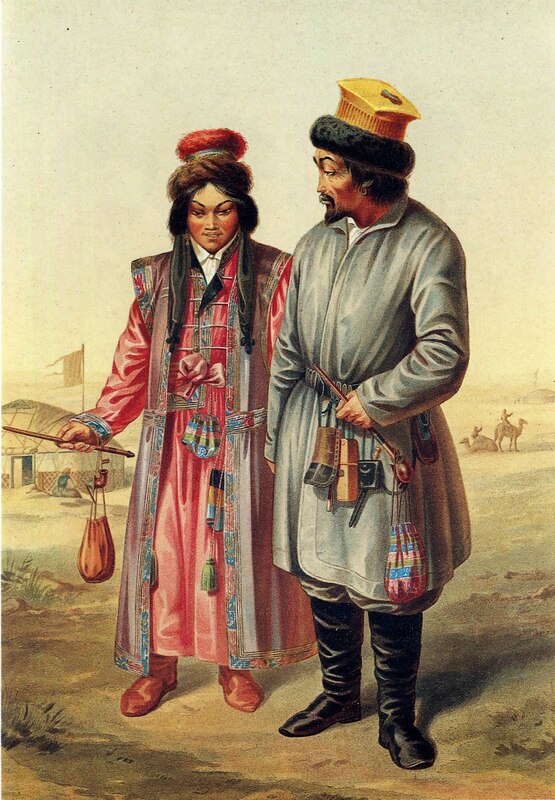 The Nogay were driven south, and now mostly live in the coastal regions of Dagestan. For a more detailed history, see this article. The Russians were at first wary of the Kalmyk, but soon realised that they in fact formed an effective buffer in front of the various Muslim Turkic peoples of the area, and came to an alliance with them. For their part, the Kalmyk nominally accepted Russian overlordship, but mostly ruled themselves. The Kalmyk are unique in Europe in that they mostly adhere to Tibetan Buddhism. To illustrate one of the frustrations of doing this kind of research, Here is a drawing done by the artist Christian-Gottfried-Heinrich Geissler in the early 1790's during his trip to the area of a Kalmyk couple. Poorly executed, short on detail, definitely underwhelming, and not very helpful. Unfortunately this is true of many artists who made such images. One has to approach their images critically. We see boots, an under robe and an over robe with sleeves on both. The sleeves on the over robe of the woman are not verified by any other of my sources. Here is another drawing made about the same time by Gustaf Feodor Pauli. 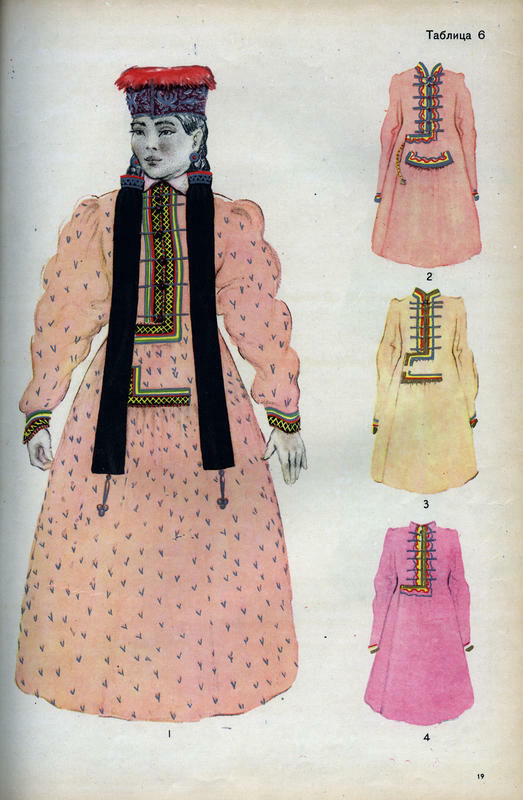 For the woman, a chemise of which only the collar shows, a long gown fastened down the front by loops and knots, typical of Mongolian garments, but with the opening centered, unlike the overlapping side opening of Mongolian robes. You will notice that the opening overlaps at the waist. 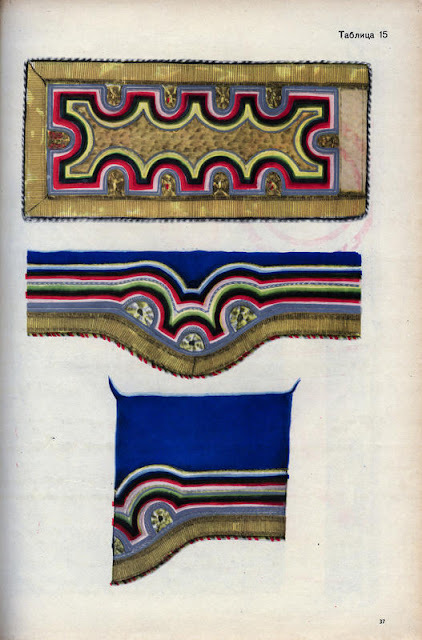 There is ornamentation on the edges of this garment under the closures, made of appliqued rows of braid. 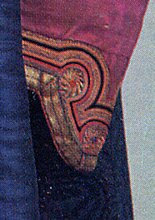 ﻿Over this is worn a long sleeveless garment with protruding shoulders, edged with ribbon, and provided with ties which may be used to close it. 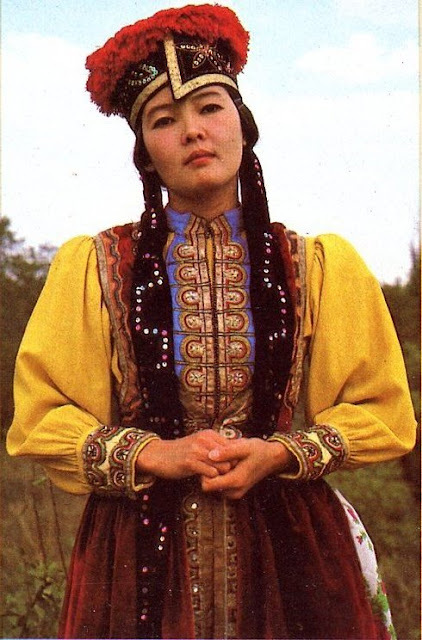 You will also see cloth sleeves covering the braids of her hair, again a feature very typical of Mongolian garments. In the background you can see camels and yurts, which the Kalmyk, like the Mongols, call 'Ger'. 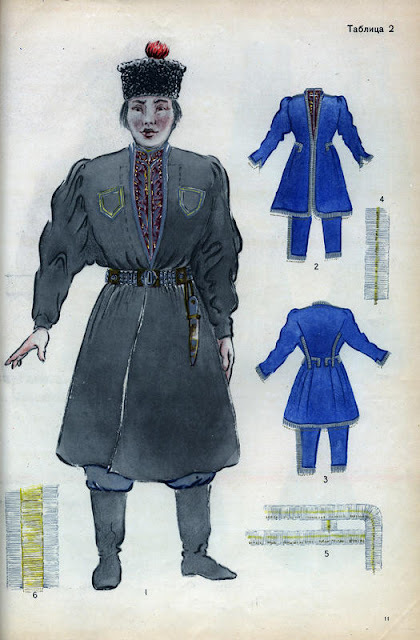 Now we turn to our old friend Max Tilke, and he obligingly has drawn us a schematic of the two garments. He also informs us that the undergarment is called. chonor. Other sources say that it is called terlyk. The chonor/terlyk is sewed shut on the bottom/ Notice that the outer garment, tsegdyk, is slit in back. this is not always the case, but it makes it easier to ride. 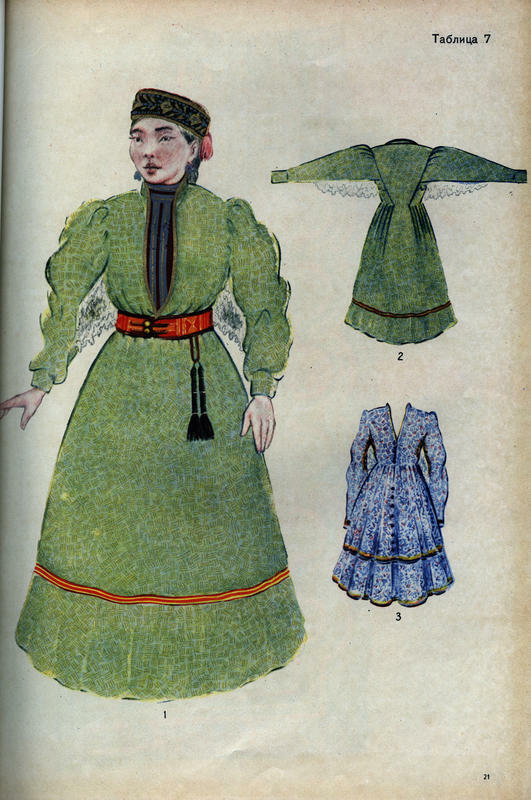 The outer garment, the tsegdyk is typically worn by married women. Here is another drawing showing the cut of the undergarment. Here is a photograph of a similar set of garments from a Russian Museum. You will notice the rows of contrasting braid around the edge of the outer garment. You can see just the collar of the chemise. The overgarment is tied shut with two ribbons ending in the flat ornamental knots so typical of east Asia. There is ornamentation on the front of the chonor/terlyk, the undergarment. You can also see the unusual shape of the cuffs, which seem to be a remnant of the famous 'horsehoof' cuffs of Mongolia. The cuff is edged with wide gold braid, then three circles are embroidered in gold thread, then narrow braid of various colors are arranged around them. 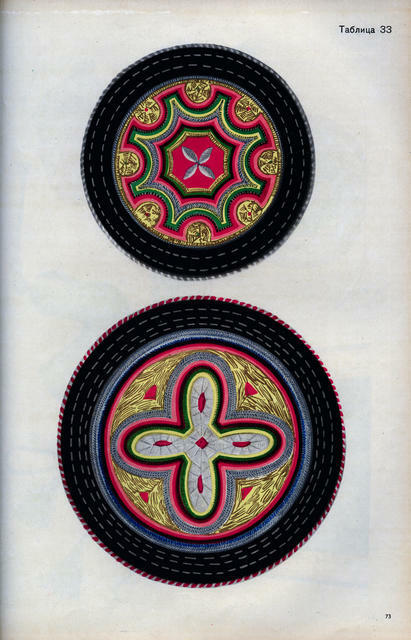 This, as we will see, is a very typical ornamental motif of the Kalmyk. Here is another exhibit, but with the outer garment left open. 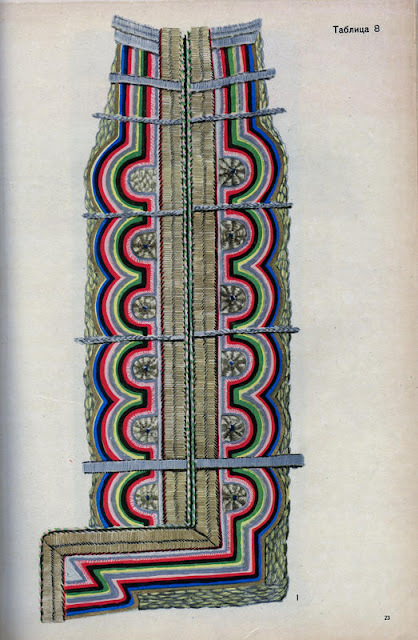 Again we see substanitally the same arrangement, on the front of the undergarment, wide monocolor braid on the edge, then circles embroidered in gold, outlined with contrasting rows of braid. The semi horsehoof cuffs and the asymmetrical cap are also in evidence. Bossert gives us this image of the ornamentation on the front of the set of garments. This type of ornament is called 'eeeg'. and on the semi-horsehoof cuffs. Here are a couple of photographs of a more recent, slightly simplified version of this costume. The semi-horsehoof cuffs have disappeared, replaced by european style cuffs, but with the same ornament, the outer garment is cut in such a way as not to cover the ornament on the front of the choron/terlyk, and there is no sign of a chemise. She is, however, wearing braid covers. The asymmetrical cap is quite unique. 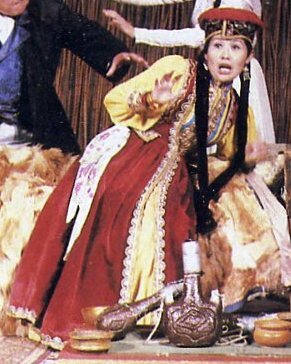 The very large pompom on top of the cap is again typical of Mongolian and Manchu garments. More closeups of this type of cap. 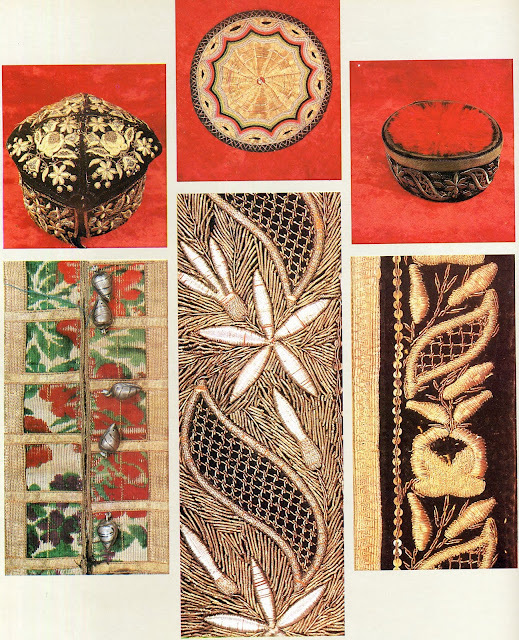 You will notice the gold embroidery on the last two examples. 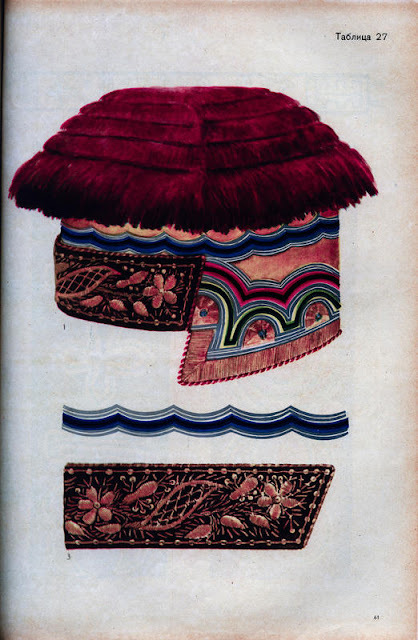 This is also common among the Kalmyk, and is also used on the costume, as well as on caps. here are a couple examples. 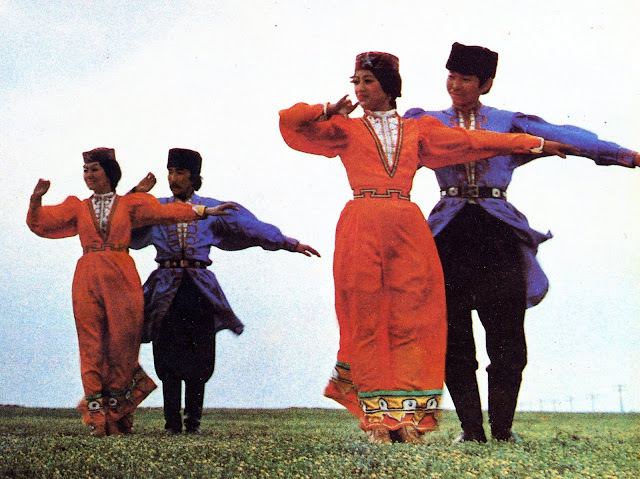 The men's costume is basically the same as that of the caucasus, a shirt, beshmet, under a jacket, Cherkesska, pants, belt with metal ornament and boots. They wear various kinds of caps. One big difference is that the sleeves are usually much fuller than in the caucuses, and are gathered into cuffs, making a winglike effect. 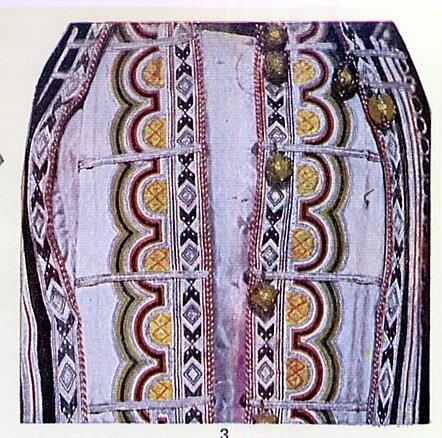 In modern performing groups, the beshmet is sometimes omitted, and the cherkesska is made to close up to the collar, and ornamentation is placed on the front where the shirt would originally have shown through. The costume of unmarried girls is somewhat different, and only includes the under dress, which is cut rather differently. Again you will notice the wing like extension on the sleeves. This is called Biizie. Here is a photograph of two variants of the girl's costume. 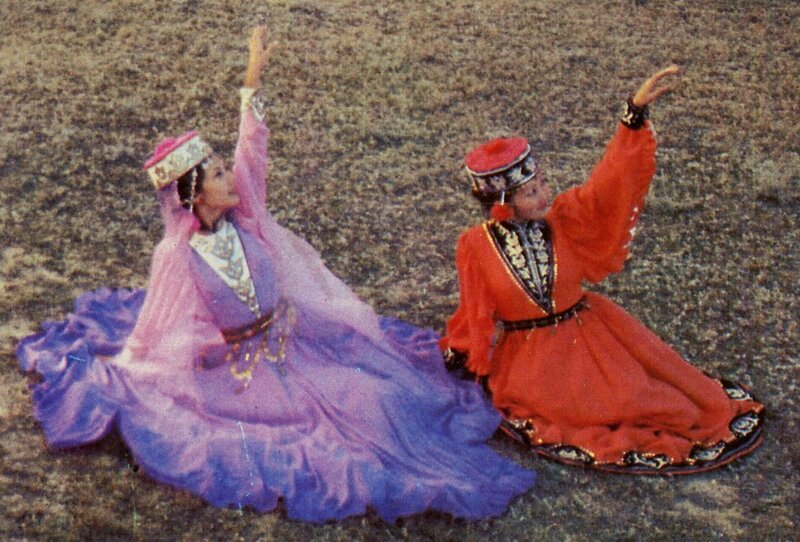 I will admit to a particular love of Kalmyk dance. Here are a couple of videos showing off the costume. First is a group of older people in the married costume. This is old style music, without accordian. The men are wearing the all in one jacket. Here is another group showing the girl's costume, and if you watch closely, the men are wearing the two piece costume, with a separate ornamented shirt under the jacket. The girls have panels of gold embroidery on the front of their dresses, and on their caps.This is the dance ensemble 'Tiulpan' or Tulip. Tulips grow wild on the steppes of Kalmykia. And just one more video, where the dancers are more visible. Again the men are wearing the all in one jacket, and the women are wearing the unmarried girl's costume as in the previous video. This is the ensemble 'Carousel'. For more information, here are a couple links to Kalmyk organisations. ﻿Thank you again for reading as always. I hope that this presentation of a rather different esthetic tradition may inspire you in your own creative work. thanx for this nice blogitem. I have an article on the cherkesska. It has many images in it. Very interesting and informative. I am an American historian specializing in the history of clothing and I am writing on the Eastern – or “Oriental” – origins of British military uniforms, circa 1670-1856. 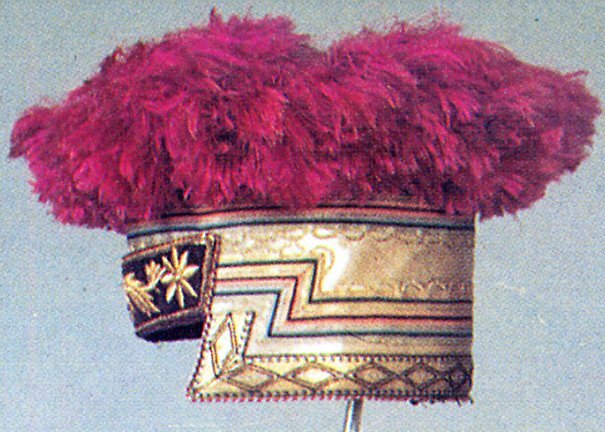 I seek information about the origin of the Polish square-topped chapka cap, which was adopted by lancer regiments all over Europe from 1784 and especially after 1815. It appears that this was originally Kalmyk, and I have information that “Muslim Tartars” from the Southern Caucuses served in the Polish army and that the Polish cavalry, and eventually much of the army, later adopted this basic cap style. Do you have any information about this and especially knowledge of published sources in English? I am happy to give you an acknowledgment in my article, which I plan to publish in a scholarly journal. Dedennus-tre, dreist-holl e-keñver padusted ar c'hinkladurioù mogoliat a-hen.